A one-month pilot project will increase campsite rates at selected parks for stays Aug. 15-Sept. 15, 2019. See the Frequently Asked Questions below for more information. This project is a second step in evaluating our ability to administer flexible fee discounts and increases. We tested a discount rate pilot project in September and October 2018. The pilot project does not include tent campsites--the rate remains the same. Why is OPRD raising rates? 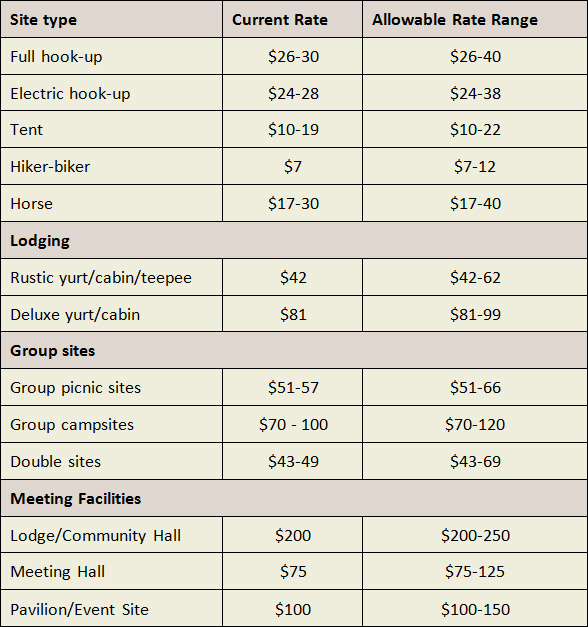 We are exploring the merits of both discounts and increases at targeted campsites, parks and times of year. The idea is to respond to the market in a controlled and selective way, while keeping camping affordable overall. At times, some rates may go up a bit at campgrounds with very high demand, and some sites at some campgrounds may go down a bit where vacancies are high. The small increase at eight parks for 30 days next summer will help our analysis of price, demand and behavior overall. It follows a targeted discount at 14 parks in September and October 2018. Targeted price increases also help us maintain high quality facilities and services at a time when demand is steadily increasing across the system during all four seasons. Additionally, we dedicate about $800,000 a year to provide discounts to certain groups including veterans with service-connected disabilities and foster families. Flexibility in determining our rates will help fund those discounts. Why does OPRD have the authority to raise rates? The Oregon Legislature passed HB 2318 in 2017 allowing us to raise and lower campsite rates within a set range. This gives the agency the ability to adjust fees in higher demand areas while keeping rates lower in parks with extra capacity. The Oregon State Parks Commission approved campsite rate increase of $5 to $20, depending on site type, at its Sept. 19, 2018 meeting. We hosted public meetings in January 2018 and August 2018 to gather public comment on the proposed rule change while it was in development. We also held a 41-day public comment period, during which time we received 47 comments. Why do we need this flexibility? Before 2017, changing rates required a two-year legislative process that included opportunity for public comment. The new rule is a more efficient, flexible approach that allows us to better manage our costs. What is the maximum I might pay? 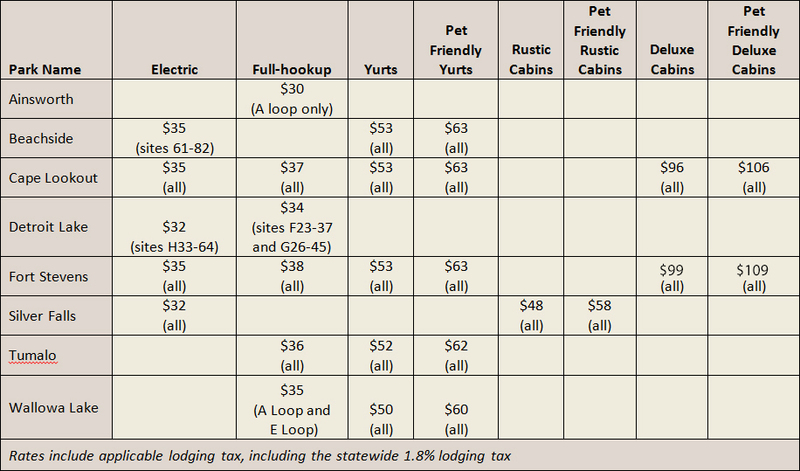 The table below shows the allowable range by facility type. We set this range wide to accommodate slow growth over several years. We don’t plan to reach the highest possible rate at this time. How often can I expect rates to change? ORS 390.124 2(b) allows the State Parks and Recreation Director to adjust a fee up to four times per calendar year. How did OPRD determine the dollar amount for the 2019 price increase? Providing affordable camping to all is core to our mission. We reviewed average prices by region and chose small increases that would allow our prices to remain at or below the market rate. How did OPRD determine which parks and sites would be included in the price increase? We selected parks in each region of the state based on historic occupancy and reservation data. The selected parks and campsites fill quickly and early for peak summer months. At four of the parks, we increased the fee only for select sites that the most popular and tend to fill as soon as the nine-month reservation window opens. These are prime sites that offer amenities such as waterfront sites, sites located in less crowded areas, and sites furthest from the highway. Will OPRD decrease costs at any parks? Yes, we have authority to decrease rates as much as we feel is necessary. We conducted a pilot discount project in fall 2018, and we’re working on another decrease for 2019. Our fall discounts ran in September and October 2018. We dropped RV campsite fees by $7 in 14 parks from across the state that traditionally have fall vacancies. In total, over 1,200 reservations were made using the discount code, representing over 40 percent of the online reservations made after the discount was announced. More than a quarter of visitors who used the discount reported the discount influenced their decision about where and when to camp, according to post-stay surveys. How may I find out about future rate changes? The most updated information will be posted on the Rates page at oregonstateparks.org.